Love this print! 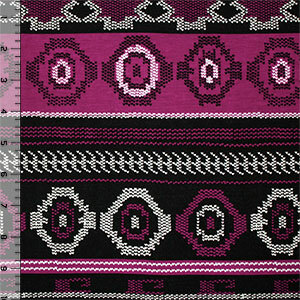 Little arrow shapes that make up an almost stitched look Navajo inspired design in magenta purple and soft black on a super soft, high quality cotton rayon spandex blend knit. 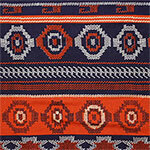 Fabric is light to medium weight, with a soft hand, and nice drape. Circle rows measure 2 1/2" (see image for scale).